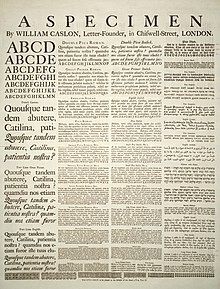 A font catalog or font catalogue is a collection of specimen of typefaces offering sample use of the fonts for the included typefaces, originally in the form of a printed book. The definition has also been applied to websites offering a specimens collection similar to what a printed catalog provides. The purpose of a font catalog is to aid a typesetter or graphical designer to choose an appropriate typeface, or narrow down candidates for the typesetting or design process. ^ Adobe Fonts, Adobe Systems Inc. This typography-related article is a stub. You can help Wikipedia by expanding it. This page was last edited on 30 October 2016, at 00:57 (UTC).